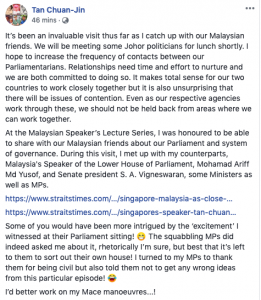 Singapore's speaker of Parliament who witnessed the shouting match in the M'sian parliament advised his fellow MP's "not to get any wrong ideas from this particular episode!" Kuala Lumpur— On Tuesday, March 19, Malaysia gave Tan Chuan Jin, Singapore’s Speaker of Parliament, a visit he’s unlikely to forget. In Mr Tan’s first official visit, he saw legislators from Pakatan Harapan (PH) and Barisan Nasional (BN) get into an argument that escalated into shouting on both sides. The raucous argument continued for some minutes even after a call for an adjournment for the lunch break from the Deputy Speaker. Mr Tan and several other officials from Singapore entered the chamber at around 12:45 in order to observe a session that was already in progress. Their presence was announced by Deputy Speaker Mohd Rashid Hasnon. Trouble began when Noh Omar (BN-Tg Karang), who had been suspended from Parliament earlier that morning for three days by Deputy Speaker Nga Kor Ming, went against his suspension. Since the decision to temporarily bar him from Parliament was made in his absence, Mr Noh wanted to challenge it and went into the chamber sometime before Parliament was scheduled to adjourn at 1:00 pm for lunch. When Mr Noh attempted to speak up, Deputy Speaker Rashid reminded him of his suspension and asked him to immediately depart. Mr Noh was answered by MP Fahmi Fadzil (PH-Lembah Pantai), who read a rule in the standing orders stating that a decision by the speaker is final. This is when the shouting began. MP Ahmad Maslan (BN-Pontian) yelled, “Gelang Patah has also done this before,” referring to former MP Lim Kit Siang, because in March 2018, Mr Lim had also been ordered to depart from the Dewan Rakyat, and refused to do so. He eventually received a 6-month suspension because he had not obeyed orders from the Speaker. At this point, backbenchers from Pakatan Harapan began to demand that Mr Noh exit the chamber. Mr Noh shouted back, “Where was my chance to defend myself? Where’s my natural justice?” He accused the legislators from PH of not respecting the rule of law. However, Mr Rashid refused to back down. He told the sergeant-of-arms to see to it that Mr Noh would exit the chamber. Mr Noh would not budge either, and for another ten minutes, both sides continued to argue, despite the fact that Mr Rashid had adjourned the session since it was already lunchtime. Later that day, after the delegation from Singapore had already left, Mr Noh announced that he accepted his suspension. Mr Tan is on a three-day visit for meetings with Malaysian leaders, which ends on Wednesday, March 20. His visit to their parliament is upon the invitation from his counterpart, Mohamad Ariff Md Yusof, Speaker of Malaysia’s Dewan Rakyat. Singapore’s Speaker of Parliament was asked to speak at the Dewan Rakyat Speaker Lecture Series, as well as to make a speech concerning governance from a parliamentary perspective. Included in the Singaporean delegation’s itinerary were meetings with the minister of legal and parliamentary affairs Liew Vui Keong and with the president of the Dewan Negara (Senate) S A Vigneswaran. Along with Mr Tan were Members of Parliament Vikram Nair, Pritam Singh, Melvin Yong, Yee Chia Hsing, Joan Pereira, Henry Kwek, Saktiandi Supaat as well as Nominated MP Anthea Ong. This is Mr Tan’s first official visit as Speaker of Parliament since he was elected to this position in September 2017.